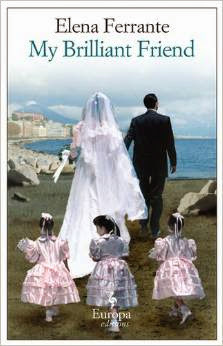 I stumbled on Elena Ferrante a few years ago and have since devoured everything she has written. She writes under a pseudonym and speculation about her identity is rampant. In Italy she is widely thought to be the male writer Domenico Starnone. I cannot believe that someone who writes so powerfully about the female experience is male–-a reaction shared by all the women I know who have read Ferrante. I don’t expect to be proven wrong, but we’ll see. My starting point was My Brilliant Friend, the first book of what is known as the Neapolitan novels, which trace the complex, emotionally charged friendship between two young women growing up in an impoverished neighborhood in Naples in the late 1940’s and early 1950’s. Their friendship is marked by intense emotional attachment, as well as growing jealousy and competition as their paths begin to diverge. Lila’s father refuses to pay her school fees, thus ending her education at elementary school. Elena’s parents, torn between pride in their daughter's achievement and fear that she will become estranged from then, reluctantly agree to let her continue her education. No one does the transition from childhood to young womanhood as powerfully as Ferrante. There are certainly cross-cultural dimensions to this transition as well as culturally specific aspects. A young girl’s bewilderment at her changing body and the responses it elicits from males is a cross-cultural experience and Ferrante brought back memories I had long forgotten. My Brilliant Friend ends with Elena determined to continue her education and Lila married at age sixteen to a prosperous grocer, someone she hoped would rescue her family from poverty and protect her from the scion of the organized crime family her family pressured her to marry. The wedding scene is brilliantly done both in terms of the complex interplay of emotions as both Lila and Elena realize how much their friendship and their world is changing and also because of the wealth of vividly drawn social detail. The novel ends with Lila’s realization on her wedding day that she has made a horrible mistake. Ferrante excels at the cliffhanger ending. It wasn’t easy to wait a year before volume two appeared to find out how Lila manages to extricate herself from a disastrous marriage.